Learn how to create your own simple, yet stylish succulent bonsai planter with this short tutorial video we created. What's great about bonsai pots is that they are shallow. Succulents tend to struggle in deeper containers, so shallow ones are the perfect size to keep their feet happy and well drained. Bonsai pots almost always have drainage holes too, which are important for succulent planters. When choosing what plants to include, consider contrasting different heights, colours and textures. Here we combined an upright, tall Crassula ovata 'Blue Bird', with a short growing Sedum species ground cover. The blue offers a nice contrast to the bright green and red of the groundcover, and we have both large, flat leaves and compact, tiny leaves in our combo. Use a good quality, cacti and succulent mix. I can't stress this enough. Your normal potting mix retains too much water for succulents; they need more drainage than a normal mix can provide. 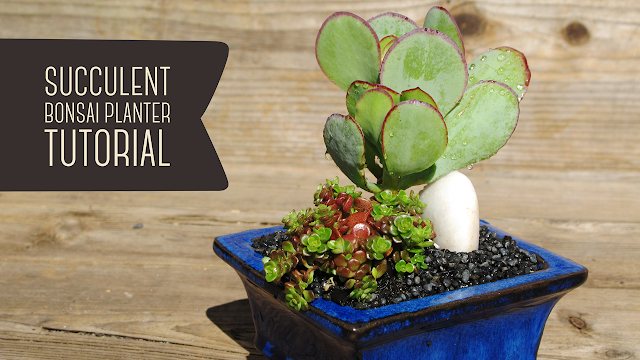 You can improve the drainage of a cacti and succulent potting mix further by incorporating perlite into the mix. It is up to you what top dressing to use. We used a fine grade black gravel, but other good toppings include pea gravel, fish tank pebbles or even sphagnum moss. Not only does the top dressing look fantastic and finish off a beautiful project like this, it helps protect the soil from the elements. It can keep the plants roots cool in summer as well as warm in winter. Include a control release fertiliser into the mix when your planting your bonsai pot and that will keep your plants happy for at least 6 months. You can also use a seaweed solution or blood and bone solution to give them a kick start. You can keep your bonsai planter either inside next to a window, or outside in a part shade position. It can be put in a full sun position once it has become established, but may still need to come under the verandah on extreme summer days. Water your bonsai planter once a day in the summer or a little less often if keeping indoors. You can cut watering right back during winter to once a week, even once a fortnight depending on its location. Prune often to keep compact and lush. This will also help to give the 'Blue Bird' a bonsai tree appearance. Get succulents and supplies for your next succulent project at www.fickleprickles.com.au. Delivery to anywhere in Western Australia.